The Field of Hope is becoming a reality. 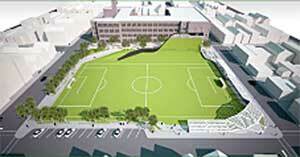 As you might already know, we have developed plans to build a community park, our Field of Hope, at Wells High School, for the benefit of our students and the greater West Town community. Currently, our students play soccer and baseball on a concrete lot behind the school. Many of our neighbors visit this open space to walk their dogs and play with their children. However, we know that we can beautify this area and make it a real community gathering place. The new park will include a state-of-the-art baseball and soccer field, as well as an outdoor movie screen, an adaptable field to facilitate little league baseball and girls’ softball, a toddler playground, and dog park. Both our students and the community will benefit greatly from this endeavor. We are set to break ground on the Field of Hope this spring, but we need your help! We are very excited about the project, and we would like to have the opportunity to share it with you. Our inaugural fundraising event will be on Wednesday, Nov. 28, from 6 to 9pm. at The Boundary, 1932 W. Division St. Tickets include appetizers, an abundant buffet, and two drinks. The evening will also feature a silent auction, music, and an exciting presentation by the Field of Hope architect, Juan Moreno. One hundred percent of the $50 ticket cost is tax deductible, and all proceeds will go the Field of Hope Fund. Ald. Joe Moreno and other government officials will be attending this event. Tickets may be purchased in advance via PayPal through our website or with cash at the door. You may also support the Field of Hope by contributing items for the silent auction. To purchase tickets or support the Field of Hope in other ways, please contact me at any time. Please share this information widely. We look forward to seeing you on Nov. 28. This is the first I have heard of this idea but where do they plan to add parking for this concept. It would seem like more than 7 parking spots would be needed for this. Any plans for additional parking? Surely this would require more that 7 spots in the video. I am also very concerned about the enormous amount of parking that will be lost as a result of this project. This area is already congested and there are no parking spots on most days. How will be enjoy the park if no one can park ???? Any word on this project? Will they be breaking ground when school gets out for summer? I say walk or ride your bike to the park.